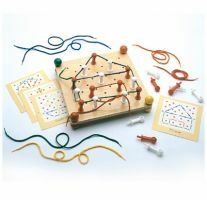 The Peg n Lace Art toy was voted Parenting Magazine’s Toy of the Year and encourages children to create 3-D designs by lacing colorful threads through pegs placed on a board. A variety of unique designs can be easily created, much to the delight of any kid. So encourage your child to use Oppenheim’s award-winning toy to develop their artistic and imaginative skills with Peg n Lace Art. Ages 3+.